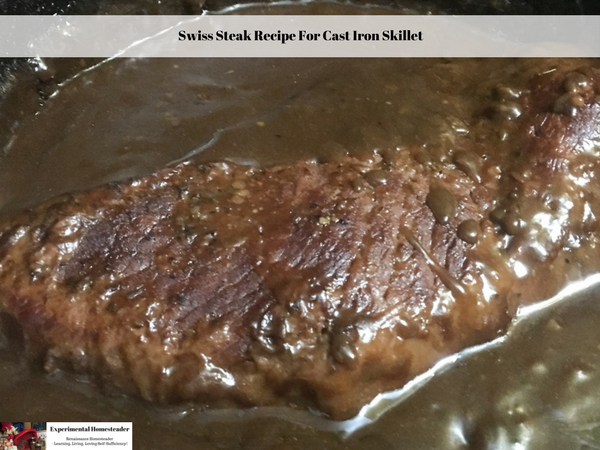 I love swiss steak but hate using a large glass pan so I decided to see if I could adapt my recipe for cast iron skillet use. 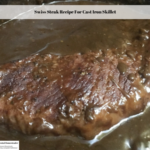 The original recipe was given to me by my grandmother in the late 1980’s, for this recipe instead of making my own gravy I bought a package of Southeastern Mills Roast Beef Gravy Mix. The recipe turned out great – and using the packaged gravy was a lot easier than mixing flour and water then adding it to the pan during the last ten minutes of cooking. Preheat the cast iron skillet over medium heat and melt the butter. Flour and season the round steak. Cook the round steak for 4 to 5 minutes per side to brown it. Prepare the gravy mix following the instructions on the back of the package but do not heat it up, just mix it up. Pour the uncooked gravy over the top of the browned round steak. Put a lid on the cast iron skillet and place it on the center rack of the oven. Bake for 2 1/2 hours, turning the swiss steak over once midway through the process. Be sure to spoon some gravy on top of the swiss steak when you do this. When the time is up, remove the cast iron pan from the oven, carefully remove the lid watching out for steam.